10 The LandReport | S P R I N G 2 0 1 6 LANDREPORT.COM L ittle known fact: I was born in the City of Light. In the late 1950s, the powers that be at Standard Oil of New Jersey dispatched my father to Europe, which is how I ended up spending the first six months of my bonnie life à Paris. Lesser known fact: I respond to commands in French immediately, if not sooner. Scold me with "Tais-toi," and I shut my mouth. Clap your hands and implore me with "Allez-y!" and I get a move on it. "À table" is the term a Frenchwoman uses to call her family to the table, and on Sundays, it was the way my mother summoned our boisterous clan and an assortment of guests plucked from the pews at church to the dining room. Something special was in the offing: a wonderful meal preceded by the Lord's Prayer and served with dollops of scintillating conversation. That's me at the head of the table in the photograph up top. Publisher Eddie Rider was hosting an adjacent table. 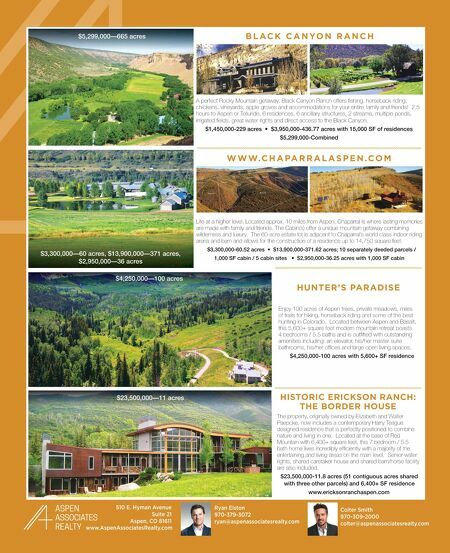 We were at the 2015 Land Report Aspen Summit, and I can assure you that something special was in the offing. Moments later, we were privileged to honor the legacy of the Salazars, whose roots in the American Southwest go all the way back to the expedition of Juan de Oñate y Salazar in 1598. Why the French lesson? Because I feel that same sort of anticipation with this issue as I did when Mom summoned us "à table". Enjoy! 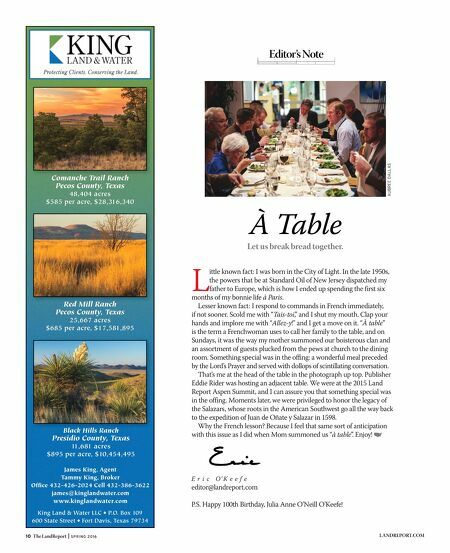 Editor's Note À Table E r i c O' K e e f e editor@landreport.com P.S. Happy 100th Birthday, Julia Anne O'Neill O'Keefe! AUBREE DALLAS Let us break bread together.